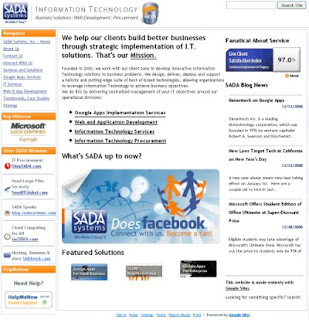 January 7, 2009-North Hollywood, CA:SADA Systems, Inc. is pleased to announce the beta release of the first major revision to their website in three years. The new website was in development for most of the last half of 2008. To streamline the website and make the content as immediately available to clients and website visitors as possible SADA elected to develop it entirely in Google Sites. Google Sites is a rich website creation solution that is part of the Google Apps suite of “software-as-service” products. Google Sites is a powerful, cloud-based communication and collaboration platform. Building the site on the Google Sites platform provides SADA with the opportunity to explore the development of unique Google Gadgets some of which can currently be experienced on the website. It is SADA’s intention that especially useful or practical gadgets developed for the website will be made available to the public in the future. “Why would a company who has web designers and developers on staff use Google Sites for their own website,” says Tony Safoian, president and CEO of SADA, “Simply because their time is better spent doing custom client work, and this new platform allows our marketing team to update our own website instantly and, without burning very expensive development hours.” Safoian’s comment refers to making the ability to update the website accessible to anybody within SADA’s organization. Updates to content, images, even videos no longer have to go through a web designer to be applied. There is no code to edit, and no special knowledge is required. SADA hopes this will ultimately mean the website is constantly being updated with fresh content, and there will always be something new on the website that will keep website visitors coming back. Google Sites provides a search box for all of their pages. This means that all content, on every page of SADA’s new site is a searchable term. Visitors to SADA’s website who are unsure how to find an article, or page, or specific content may enter search terms in the search box provided on the website. Google’s own search engine then crawls the website and returns pages with content matching the visitor’s request. SADA hopes this will help make the new site easier to navigate, and more meaningful to website visitors.